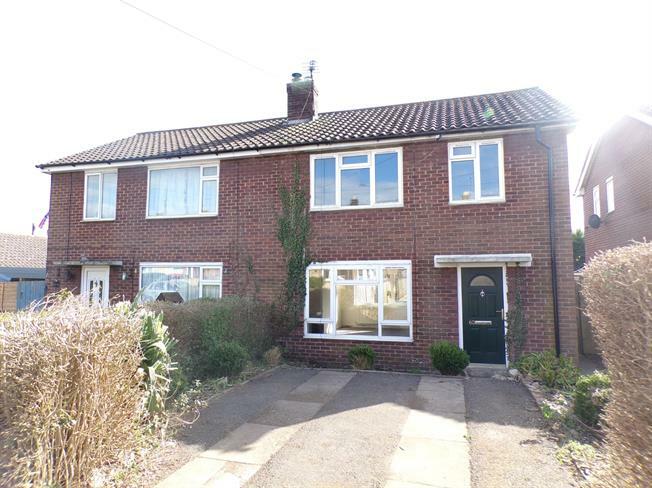 3 Bedroom Semi Detached House For Sale in Warwick for Guide Price £170,000. A three bedroom traditional semi-detached home situated in the popular pretty village of Kineton. The property is sold with no onward chain and enjoys spacious accommodation requiring some updating within a generous private plot. Allowing potential for extending and enlarging subject to the necessary planning permissions. The accommodation allows; entrance hall, sitting room with dual aspect, kitchen, three bedrooms and a bathroom. Outside is a lawned rear garden, two brick built out buildings and potential for parking to the front if the kerb is dropped. Viewing is advised. A cloak cupboard and a further walk in storage cupboard. Stairs rising to the first floor. Door to the garage. Radiator. White low level w.c and wash hand basin with tiled splash back. Double glazed obscure window to the front elevation. Radiator. Two double glazed windows to the rear elevations and French doors opening onto the rear garden. Gas coal effect fire with decorative surround. Two radiators. Coving. Double glazed window to the front elevation. Fitted cupboards. Radiator. A range of matching wall and base units including work surfaces incorporating a stainless steel sink and drainer unit. Integrated is a four gas hob with extractor fan overhead and separate electric double oven. Further integrated is a dishwasher and fridge freezer. Tiling to the floor. Double glazed window over looking the garden and French doors opening onto the garden. Downlighters. Radiator. Wall and base units incorporating a stainless steel sink and drainer unit. Space for a washing machine and tumble dryer. Wall mounted boiler. Door to the garden. Tiling to the walls and floor. Radiator. Porthole window to the rear elevation. Airing cupboard housing the hot water tank. Coving. Double glazed window to the rear elevation with open views. Coving. Walk in dressing room with radiator. Two radiators. White suite allowing a low level w.c, wash hand basin, bath with hand held shower and separate shower cubicle. Velux to the rear elevation. Tiling to the walls. Heated towel rail. Double glazed window to the front elevation. Coving. Walk in dressing room or wardrobe with radiator. Radiator. White suite allowing a low level w.c, wash hand basin and double tray shower. Tiling to the walls. Double glazed obscure window to the side elevation. Heated towel rail. Double glazed window to the rear elevation. Radiator. Coving. Loft access. Double glazed window to the front elevation. Radiator. Coving. White suite allowing a low level w.c, wash hand basin and bath with hand held shower. Tiling to the walls. Velux window to the side elevation. Heated towel rail. Up and over door remote control door. Fitted cupboards to the rear of the garage with work surfaces. Electricity and lighting. Shelving. A stunning garden with well stocked colourful borders. Laid to lawn with a two patio seating areas with sun awning. Enclosed by fencing and side gated access. Shed. We understand there to be a service charge of £100 per annum.